Heart installations have now occurred in a variety of formats allowing smaller numbers of hearts to be shown and interacted with. An open circle of 200–400 cloth-wrapped hearts that has a central empty area of approximately one metre in diameter. A white cloth hangs nearby (replaced in some versions by a temporary construction fence), next to a table with pens. 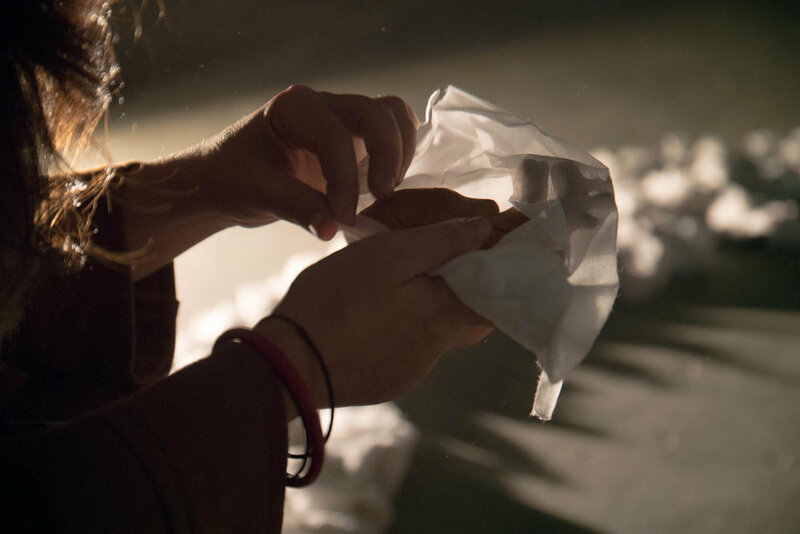 Participants are invited to step into the empty space, pick up a wrapped heart, unwrap it and place in the empty space. They then write their own response on the cloth and pin or tie it to the cloth/fence. They are asked to reflect on their own connection to people seeking asylum and what it means to belong. 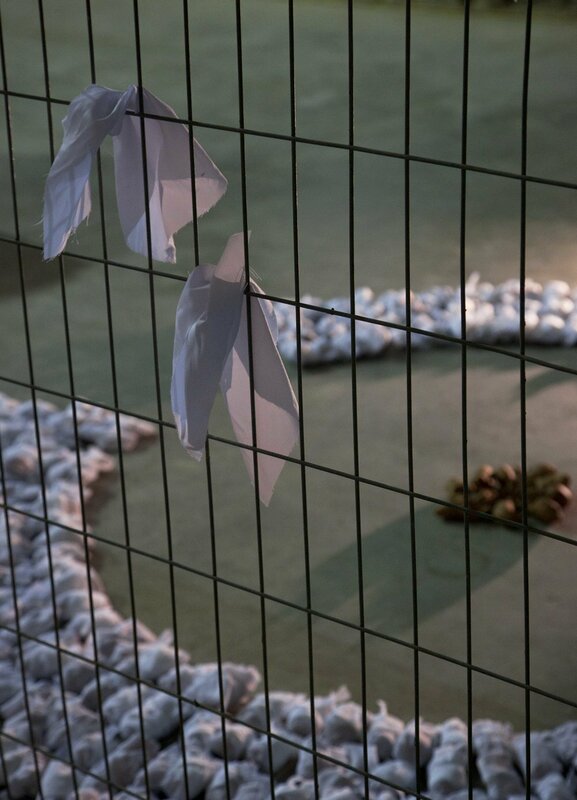 Over time the installation transforms as the hearts move to the centre of the space and are unwrapped, changing from small white rock shapes to a circle of exposed terracotta hearts. Between 700 and 2000 wrapped hearts are laid out in a double spiral on the ground. The double spiral allows a walker to walk to the centre of the spiral and continue, exiting at a different point. Wire is strung up or temporary fencing is placed nearby, adjacent to a table for writing responses on cloth. The spiral takes time to walk, with attention required to avoid stepping on the rows of hearts. The meditative process of a spiral allows views forward and back of wrapped hearts until the participant stops to pick up and unwrap a heart. The heart is replaced in the spiral, while the cloth is kept as the participant continues through the spiral to the table to record their own response. Over the course of the event (depending on venue this can be one day or more) the spiral transforms as hearts are unwrapped. A one day event, Stairway to the Heart was installed on the massive bank of stairs leading to the Willoughby Council Performing Arts Centre. Two thirty-metre lengths of white open-weave muslin cascaded down the staircase. Wire was strung on a banister between the two lengths of cloth. A large ceramic heart with an inscribed map of the world was placed between them at the foot of the stairs. Each length of cloth held a total of 800 hearts, wrapped and unwrapped. 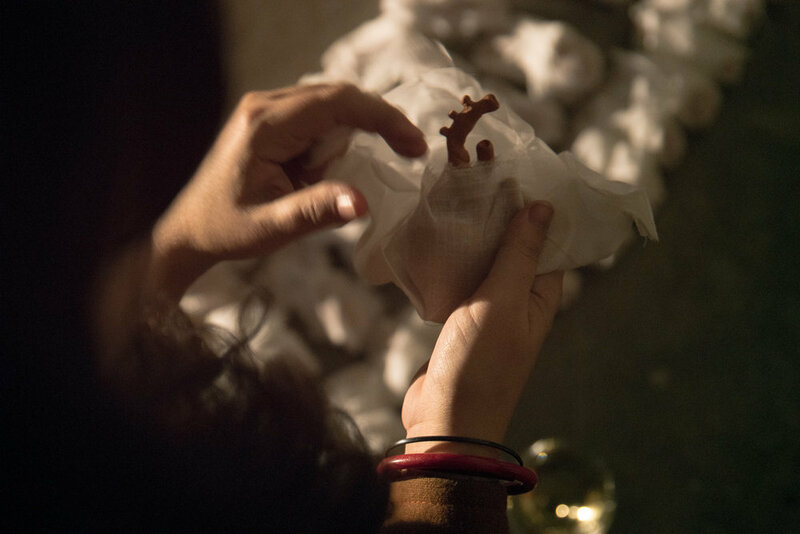 The public were invited to walk up the stairs, read the inscriptions on the unwrapped hearts, and then pick up a wrapped heart, unwrap it, replace it on the stair and use the cloth to write a response on. Responses were then tied with red ties to the wire strung between the staircases. A one day event, Heart Awakening was an Open Day installation at the art school. Around 500 unwrapped hearts were strewn on a patch of bare earth, placed there in the week beforehand so that they had been exposed to wind and rain. Seven large turquoise-glazed bowls were placed among the hearts and filled with water. Each bowl was inscribed in English and in another language (Arabic, Farsi, Tamil, Spanish) with Again, my heart is beating. Participants were invited to enter the field, pick up a heart, brush it clean and ritually wash it in one of the bowls. They then took the heart and wrapped it in white cloth and recorded their own responses in a book if they wished.